Nissan Design has launched an initiative for design aspirants in the country. The initiative named Roots of Design aims to encourage students to explore a career in arts, design and creativity. 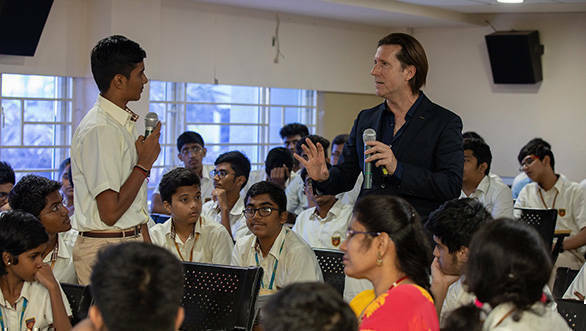 Senior VP for global design, Nissan Motor Co Alfonso Albaisa launched the programme in India at Chennai Public School, Anna Nagar Campus, Chennai. The manufacturer has previously launched similar initiatives in Dubai, Bangkok, Singapore, and Beijing. The initiative is aimed at inspiring students and developing a different perspective towards design and creativity to solve new problems in the automotive industry in the future. During the event, Albaisa addressed the school students from classes 11 and 12, as well as their parents and teachers. He gave them a first-person account of the opportunities that a career in design opens up. He also explained to them Nissan's design philosophy and future auto industry trends including artificial intelligence, and automation. "Designers will play a key role in what the future looks like, not just in the auto industry, but across technology, infrastructure, electronics, consumer durables etc. Through Roots of Design, we are opening the doors to the world of design and the numerous opportunities it offers for aspiring students across the globe", he added. Nissan has also stated that a report by British Council in partnership with Design Council of India has pegged the potential of the market for design in India to touch Rs 188.32 billion by 2020, of which only a fifth has so far been tapped.